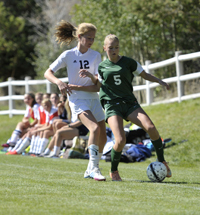 Community School soccer teams tasted victory in High Desert Soccer Conference contests on Wednesday. The league-leading Cutthroat girls (5-2-0, 5-0-0 league) recorded their third straight High Desert shutout 3-0 over the Filer Wildcats on the Sagewillow Farms pitch. “Player of the Game” Josie Allison tallied a three-goal hat trick, her second of the fall season. Assists went to Ella Pepin and Ellie Polk. Filer (5-3-0, 3-2-0) was the Cutthroat opponent in last October’s High Desert tournament finale won by the Cutthroats 6-1 for their fifth straight league tourney title. The Cutthroat boys (7-1-0, 5-0-0 league, 55-7 goals-against) romped 8-0 over Filer in Wednesday’s nightcap at Browning Field. “Man of the Match” Willis Sanchez-duPont chalked up his fourth shutout as the Sun Valley goalkeeper. Scoring goals were Jay Fitzgerald (2), Tanner Josey (2), Johnny Blackburn (2), Dehner Figge and Jackson Dies with his first-ever varsity goal. Filer dropped to 4-4-0 (2-3-0 league). The Cutthroat teams host Wendell on Monday, Sept. 15. The Trojan girls (1-4-0 league) enter after a 5-0 loss at Bliss Monday. For the Cutthroat boys, it’s their first meeting with Wendell since falling 6-1 to the Trojans in the 2013 State 3A tourney consolation game. Wendell (3-0-2 this season, ties against Gooding and Buhl, 29-8-5 three years) has won the state consolation title the last two years. Coach Richard Whitelaw’s Cutthroat boys travel to the 4A Burley Bobcats (0-4-0, 0-2-0) Saturday, Sept. 13 for an 11 a.m. game. Burley played at Wood River Thursday.